Blepharoplasty or eyelid/eyebag surgery can help restore a more youthful appearance by tightening droopy or hooded eyelids, restoring the smooth line of the eyelids, and removing or moving fatty pouches beneath the eyes or "bags". It cannot, however, remove dark circles under the eyes, lift sagging eyebrows (a browlift will do this), or smooth fine wrinkles or crow's feet from around the eyes. It is often our eyelids which show the signs of ageing first which is why this can be the first cosmetic treatment which a man or a woman might choose. Eyelid surgery is generally performed under a local anaesthetic, but some patients are given sedation via an intravenous drip or a general anaesthetic. Most people find that they are ready to go out in public and be seen in around a week to 10 days. It is unlikely that anyone considering upper or lower eyelid surgery would be able to access this free of charge on the National Health Service (NHS). Private costs for blepharoplasty can range from approximately £1,500 - £2,500 for upper lid surgery only, £2,000 - £3,000 for lower lid surgery only, and £3,000 - £4,500 for upper and lower lid combined. Upper and lower eyelid surgery or blepharoplasties are the 3rd most common surgical procedure in the U.S. with 143 390 procedures performed in 2017 alone, an increase of 26.3% on 2016 figures, and an increase of 33.5% on the number of procedures originally recorded for the procedure in 2012, according to statistics from the American Society for Aesthetic Plastic Surgery (ASAPS). As we age, our skin can become thinner and less stretchy. Our muscles can weaken and fat that cushions the eyeball moves forward through spaces in the muscle around the eyes, causing "bags". Sagging upper eyelids may result in a “hooded” appearance over the eyes. In severe cases of eyelid hooding, vision can be affected. It is often our eyelids which show the signs of ageing first which is why this can be the first cosmetic treatment which a man or a woman might choose. Eyelid surgery can help restore a more youthful appearance by tightening droopy or hooded eyelids, restoring the smooth line of the eyelids, and removing or moving fatty pouches beneath the eyes. Some people suffer from eyebags, caused by pseudohernias of fat (which is fat pushing through the wall of the eye muscle) at a young age. This tends to be hereditary (an inherited condition from within the family) and can be corrected with a lower eyelid blepharoplasty. Blepharoplasty, however, cannot remove dark circles under the eyes caused by dark pigmentation of the skin or by very thin, translucent (“see-through”) skin. It does not smooth fine lines and wrinkles around the eye or "crows' feet". It cannot lift sagging eyebrows either. Low eyebrows can only be raised in a brow lift operation. Blepharoplasties are sometimes performed alongside a brow (forehead) lift or face lift. It can also be combined with laser skin resurfacing or a chemical peel to smooth wrinkles, or with botulinum toxin injections to produce a better final overall result. If you are considering eyelid surgery, the following information will give you a basic understanding of the procedure. It can't answer all your questions, since a lot depends on the individual patient and the surgeon. What happens during a Blepharoplasty (eyelid surgery) operation? In your first appointment with a surgeon, you should clearly explain your expectations of the surgery and how you would like to look afterwards. Careful discussions regarding your reasons for wanting eyelid surgery are very important at this stage. Make sure that you obtain as much information as necessary to enable you to make a fully informed decision about whether to go ahead with the surgery. The surgeon should also ask for your medical history to make sure that there are no reasons why you shouldn’t have eyelid surgery. At this point, you would also normally be asked to sign a consent form indicating that you have understood the future benefits and possible risks associated with the procedure. Photographs of your eyes may also be taken by the practitioner, for a “before and after” comparison later. The surgeon may wish to write to your G.P. giving details of the operation so that if there are any problems associated with it in the short or long-term, the G.P. is aware of the surgery and can help you if you require any further treatment after the operation. Before your surgery, your surgeon may require you to be examined by an ophthalmologist (specialist eye surgeon) to test for glaucoma (a disease affecting your eyesight) and to make sure that you have no problems with tear production. The operation is generally performed under a local anaesthetic, but some patients are given sedation via an intravenous drip. In rare cases, a general anaesthetic can be used. As in any surgical procedure, the use of a general anaesthetic carries a small additional risk which your practitioner will discuss with you. No form of anaesthetic will be given to you without your surgeon discussing it with you first. The surgery is usually performed in an outpatient surgical centre, which may either be separately run by your surgeon, or may be part of a hospital. Blepharoplasty is usually performed under a local anaesthetic, and eye drops are used to anaesthetise the eyes, then protective contact lenses may be placed over the eyes during the surgery. When the anaesthetic has taken effect, a mixture of adrenaline and lignocaine (a local anaesthetic) is injected into the eyelids before any cuts are made by the surgeon. Then, excess skin is removed and a thin strip of muscle is also taken out to give the eyelid crease more shape. Next, unwanted fatty tissue is removed and the cut is then closed with a single layer of stitches, hiding the scar inside the natural fold of the upper eyelid. 2) a technique called transconjunctival blepharoplasty may be used if you have a pocket of fat beneath your lower eyelids, but do not have any loose skin. It is usually performed on younger patients who have fat pads that push out through the eye muscle wall into their lower eyelids. The transconjunctival method leaves no obvious scars. The cut is closed with self-dissolving stitches or is left to heal naturally. In addition to this surgery, a lid tightening procedure may be recommended and can be performed at the same time. In younger patients, fat may not be removed, specifically from the lower lid unless as described. This is because if the lower lid if over resected it can create a hollow look in years to come so surgeons have become much more cautious in this area, not only in terms of fat resection and preservation in the younger group but for all patients who may actually benefit from non-surgical alternatives to address the lower lid area such as fractional laser skin resurfacing or dermal fillers used for tear trough treatments. A newer procedure sometimes used is the so-called S.O.O.F. lift. This is an abbreviation for a procedure which lifts the Sub Orbicularis Oculi Fat (SOOF) pad (the fat in the eyebags). Usually in standard blepharoplasty operations, the fat pads inside the eye bags are removed along with any slack muscle tissue. If you choose to have a S.O.O.F. operation, the fat is put back behind the muscle underneath the eye instead of being removed completely. If too much fat is taken away, the eyes can take on a sunken appearance. The S.O.O.F. technique avoids this as the fat is not taken away. 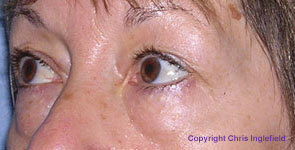 A blepharoplasty operation takes about 2 to 2 1/2 hours for the upper and lower lids on each eye to be treated. If you are having another procedure, such as a facelift, at the same time, then an overnight stay in hospital may be required. Otherwise, patients can usually go home after eyelid or eyebag surgery on the same day as their operation. How long will it take to recover from eyelid or eye bag surgery? Most patients find that they are ready to go out in public and be seen in around a week to 10 days following this procedure. Most of the swelling and bruising will have subsided after this period of time. What are the risks and potential complications from Blepharoplasty surgery? The eyes can be uncomfortable and swollen following surgery to your eyelids. The pain usually stops a few days after the surgery, but swelling may persist for over two weeks. temporary blurred vision; dry or gritty eyes; temporary problems with too much tear production; difficulty closing the eyelids completely. The following are more serious but unusual difficulties following eyelid surgery: infection; bruising; a reaction to the anaesthetic; nerve damage; the occurrence of asymmetries (i.e. the eyes looking lop-sided) or irregularities in the eyelid. A more serious, but very rare side effect, is bleeding behind the eye (retrobulbar haematoma). What should you do after a Blepharoplasty (eyelid surgery) operation? It is very important that you follow the advice of your surgeon carefully after your treatment. Who should not have a Blepharoplasty operation? There are few reasons why you shouldn’t undergo this procedure, but you should be in good general health and have realistic expectations of the outcome. People suffering from glaucoma, (an eye disease that can cause loss of vision), or from dry eyes which do not produce enough tears, can have a higher risk of problems following the treatment and your surgeon may recommend that you don't go ahead with a blepharoplasty if either of these conditions are very severe. If you have experienced healing problems with any past surgical treatments or if you are prone to keloid (red, angry, raised) scars, your surgeon may not recommend eyelid surgery or may caution you that scars could be very visible and permanent. Who can perform eyelid surgery (Blepharoplasty)? Only fully trained and qualified Surgeons should perform a Blepharoplasty or Eyelid Surgery procedure. Is Blepharoplasty available on the NHS? It is unlikely that anyone considering upper or lower eyelid surgery would be able to access this free of charge on the National Health Service. However certain regions do make special cases, especially in situations where hooding of the upper eyelid is impairing your vision. We would always recommend that you visit your General Practitioner before embarking upon a cosmetic procedure involving surgery. What is the average cost of Blepharoplasty, eyelid surgery? £3000 - £4500 for upper and lower lid combined. Blepharoplasty, or upper and lower eyelid surgery is a very common procedure that can make quite a dramatic difference to your appearance, especially if you have large bags underneath your eyes. Although surgery is involved, a local anaesthetic reduces risks, and in the hands of a skilled surgeon there are generally few problems after this operation. 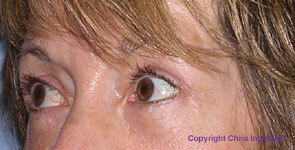 Lower eyebags clearly visible before surgery (left) and 3 months after blepharoplasty surgery (right). Photographs courtesy of Consultant Plastic Surgeon, Mr Christopher Inglefield, BSc, MBBS, FRCS (Plast) at London Bridge Plastic Surgery. Click for ALL Blepharoplasty (Eyelid Surgery) clinics in the UK & Ireland registered and verified by Consulting Room.